Preventive dental care is essential to maintaining healthy teeth and gums, kids are the most prone to cavities so it is important that they learn at an early age that brushing at least twice day is important for them to have a healthy mouth and a beautiful smile. Kids will be kids; so an important part of good oral hygiene and preventive care is having regular Dental Cleanings at our Sugarland Tx location. Dental cleanings will remove plaque and tartar from your son’s or daughter’s teeth. Routine cleanings primarily clean the tooth from the gum line up and are not meant for serious forms of gum disease where a deep cleaning (scaling and root planning) may be necessary. Dental exam to diagnose any cavities or other dental conditions. 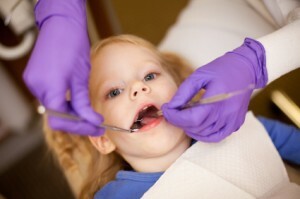 The hygienist will take x-rays of your child’s teeth unless you had x-rays recently. The x-rays help locate disease and decay not seen by the naked eye. Dr. Shilpa will perform a thorough exam and check for cavities and other conditions. She will discuss the results of the exam, and answer your questions about the recommended treatment and dental health in general. The hygienist will clean and polish your child’s teeth to remove plaque, a sticky film of bacteria on the teeth that produces acid that causes tooth decay. The hygienist will also teach proper flossing or answer any questions about cavity prevention or dental hygiene. Dental Sealants are mainly used to protect the chewing surfaces of the permanent back teeth (molars). The first of these molars grow when children are about six years old. Another set comes about six years later. Sealants are used as a long-term preventive measure against tooth decay. They clearly lower the risk of tooth decay on the chewing surfaces of molars. Resin sealants last longer than glass ionomer cement. Dr. Shilpa will check whether the sealant is still there during routine dental check-ups. If the sealant has worn away, she can re-apply it. Healthy Teeth Pediatric Dentistry provides dental services for children of all ages including Teeth Cleaning and Dental Sealants. We see patients from Sugar Land, Greatwood, New Territory, Telfair, Stafford, Richmond Tx, Rosenberg, Katy, Fulshear, & Houston. Call Today to schedule your child’s appointment most dental insurances accepted.